June 23rd, 2015 | Posted by Velda in ACUPRES.,MERIDIANS, REFLEX. 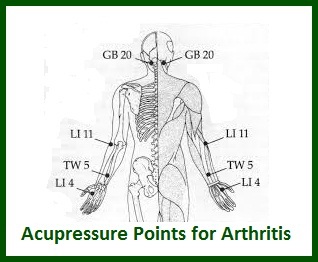 Massaging the Chinese Reflexology points for the face relieves headache or migraine pain. 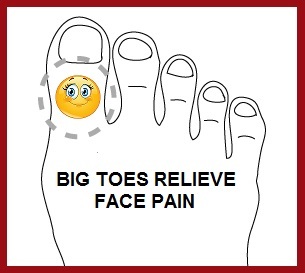 This might surprise you that the top of big toes corresponds to the face, all the way from the forehead to the neck. Massaging this point is best for just below the eyes, in your cheeks, the jaw area and the front of your face. Use your thumb to rub the top of your big toe, side to side, working your way from the base of the toenail to the base of the toe. When you get to the bottom of the toe, start again at the top. Repeat for 30 to 60 seconds. 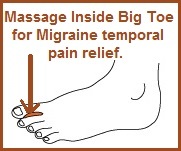 The Chinese Reflexology point for Migraines (temporal area of your head) is located on the inside of your big toe between the big toe and second toe. 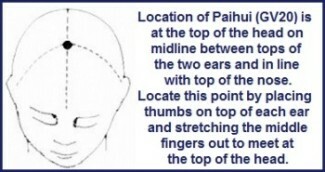 If you are experiencing headache or migraine pain on the left side of your head, rub the Chinese Reflexology point on your RIGHT foot and vice versa if it’s on the right side of your head. 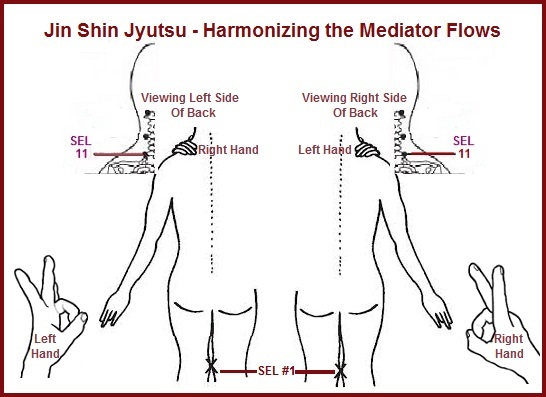 The reason why you rub the opposite foot is because the energy meridians cross over at the neck and thus, flow through the opposite sides of your head. 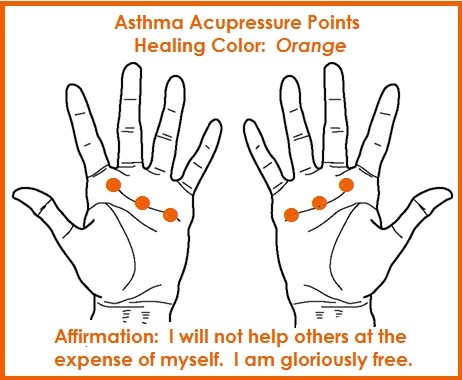 If you’re feeling pain on both sides, rub the points on both of your feet. You can also rub this point daily even when you don’t have pain. The consistent massage will help the Qi to flow more smoothly through your temporal area and thus, help to alleviate your symptoms over the long-term. 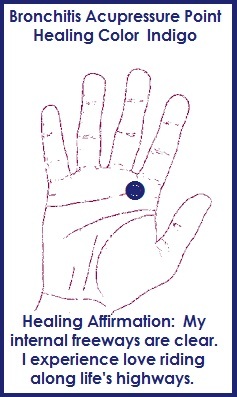 To massage this point, use your thumb to press and rub side to side on this area. Start at the tip of your toe and work your way down. When you get to the base of the toe, pick up your thumb, place it back at the top of the toe and repeat. Massage for 60 seconds to help smooth the flow of Qi. Warning: Hand Reflexology should not be used for Headache and Migraine on a Pregnant Woman. April 23rd, 2015 | Posted by Velda in ACUPRES.,MERIDIANS, REFLEX. First off I want to shout a warm hello and thanks to a reader in South Dakota for extending her appreciation of bwb and asking some great questions that are responsible for today’s blog. 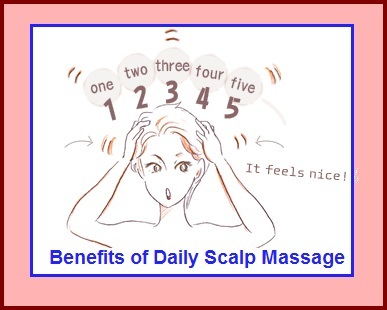 She has been giving herself scalp massages, where she probably benefits from acupressure, reflexology, and shiatsu points that release pain and emotional blockages from other parts of the body. 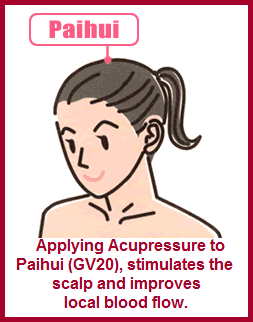 Massaging the Paihui point (GV20): The Paihui is the most sensitive and essential area in your scalp. A short 5 minute massage of this area everyday will help in the growth of hair. Place all your fingers of the right hand on the Paihui. Gently push your fingers in the vertical direction (from your forehead to the back of your scalp) massage should be soft and soothing. You will see results in a short time. 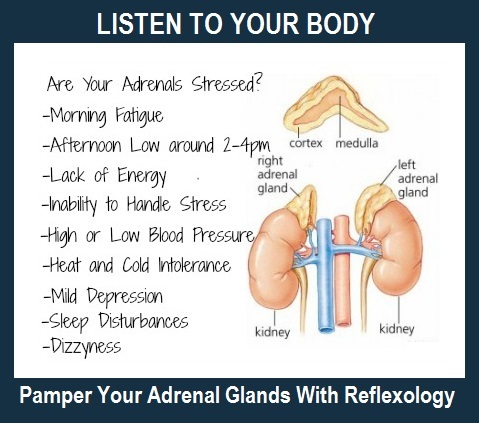 Promoting feelings of deep relaxation in the body. Stimulating the release of the body’s natural feel-good hormones – endorphins. When massaging the scalp and you feel bumps that are sore, these are probably calcium deposits (salts that harden under the skin). You can massage these areas gently. They generally are not harmful, but can be painful. I recommend you check out the different natural remedies that can be used to help treat this condition. February 26th, 2015 | Posted by Velda in ACUPRES.,MERIDIANS, REFLEX. 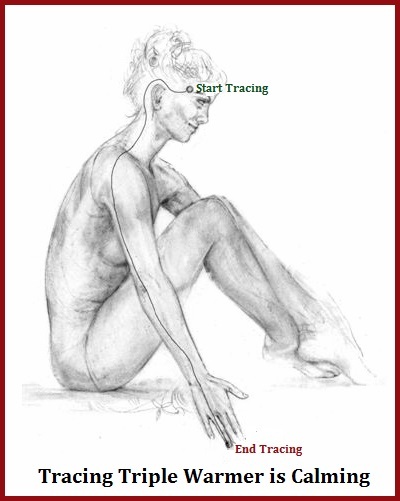 The ears contain physical and emotional reflexology areas and points corresponding to major body parts and areas. Today lets concentrate on the emotional reflexology points. 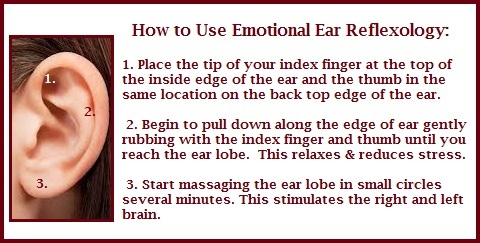 Rubbing your ears sends happy feelings into your body by triggering the release of brain endorphins. The simple act of touch alone is very healing. 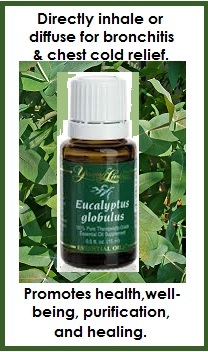 It boosts the immune cells in your body, reduces feelings of stress or anxiety and helps you relax. Sit somewhere quiet and comfortable. Keep your back straight. Start by following Step 1 & 2 described in the illustration above. Step 3 use your thumb and index fingers to gently massage your ear lobes in small circles. Your ear lobes are energetically linked to your brain. When the right ear lobe is massaged it allows the left brain and pituitary gland to become stimulated. When the left ear lobe is massaged it allows the right brain and pineal gland to become stimulated, giving you a whole brain experience. 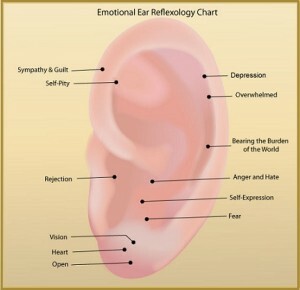 This Emotional Ear Reflexology can be done for 1-2 minutes, 2-3 times a day.